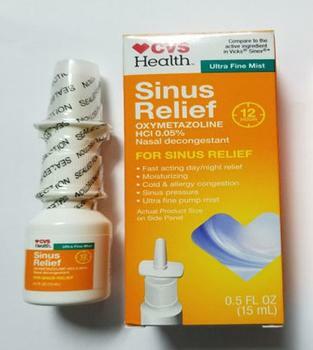 Product Quest Manufacturing is recalling Lot# 173089J of CVS Health 12 Hour Sinus Relief Nasal Mist, a clear, colorless liquid. The product was found to have had microbiological contamination identified as Pseudomonas aeruginosa. Repetitive use of a nasal spray containing a gram-negative pathogen can potentially lead to colonization and subsequent infection which can be life threatening in certain consumers, such as those with cystic fibrosis or immuno-compromised. The product, used as a nasal decongestant and packaged in a 0.5-fluid ounce bottle that is placed in an individual folding carton, was distributed Nationwide to retail outlets. 16,896 units were released with UPC code 50428432365 and an expiration date of 09/19. Lot 173089J and EXP 09/19 is coded on the side panel of the carton. Customers who purchased the recalled product should stop using it and return it to the place of purchase, or discard it. Consumers with questions may contact Product Quest Manufacturing at (386) 239-8787, Monday through Friday from 8 am to 4 pm (EST).